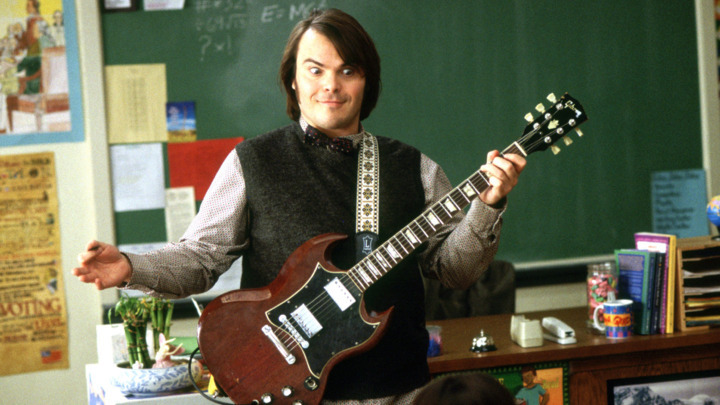 School of Rock (2003) – Review – Stuff and That. Time for another movie review. I haven’t seen a new movie though, so I’ll write one about an old one instead, 12 years too late but who cares? I don’t, do you? Seeing that Jack Black hasn’t done anything notable of late, I’d thought I’d write something about one of his finest, funniest and flippin’ fantastic films. The story itself is very original. Black plays a passionate rock fanatic who has recently been kicked out of his band and is on the verge of eviction, cheery, eh? When a prestigious school rings up asking for his roommate, a substitute teacher, to take a few classes, Black poses as him and takes the job to earn money to pay his rent. However, when he finds that the kids are virtuoso’s at classical instruments, he sticks them on more modern instruments and forms a rock band. At the beginning, he uses them as a ploy to play the Battle of the Bands, but he finds they “touched” him and that he may have “touched” them too and sees that money isn’t the most important thing. Aww! Seriously though, it’s clever, it’s funny, it’s charming. The role of Dewey Finn was written for Jack Black, obviously it couldn’t be played by anyone else. The amount of effort he puts into the role is shown on screen and he puts in a lot of effort. Now, to talk about the kids, I’m going to have to put aside my irrational hatred of them and judge them as actors/actresses. The kids, on the other hand, are moderately talented and contribute to the aforementioned charm of the film. Without them, it would just be guy who goes to a concert, plays and loses, not nearly as entertaining a film. Joan Cusack is transformed into a stuck-up, rule driven headmistress who, as the film goes on, becomes looser and more pleasant to be around, contrasting Black’s character development, which goes from slacker to a bit-more-responsible-but-still-slacking-because-it-shows-that-no-one-can-tell-you-to-change-and-that’s-an-important-moral-kids-can-respond-to slacker. When I say “comedy”, I do not mean her. The comedy is great, with Black’s jokes always being on point without being too adult, but just enough to keep an older audience entertained. However, as the picture above shows, the other comedians and miscellanious jokes aren’t as great. I see the film on a slight bias because I grew up watching it, but even I can’t deny that some of the jokes are cringeworthy, ’nuff said. Futhermore, as a music orientated film, the music is nothing to moan about. The songs are catchy and Jack Black’s talent and style shine throughout. Being born in the noughties, I see this as a nostalgic, fun film that I can’t say a bad word about. On the other hand, I am also a pretty crap, amatuer reviewer but a reviewer all the same so I can’t be too biased for it. It is a great film that the entire family can genuinely enjoy and if you haven’t seen it, I’d recommend you see it at least once and if you don’t like it, fair enough. I like it though and it’s my website so shut up and listen. M’kay? Don’t get this sort of attitude on IGN, do ya? Not essential viewing, but definitely a fun watch.